I LOVE LOVE LOVE this guy! He makes me laugh! 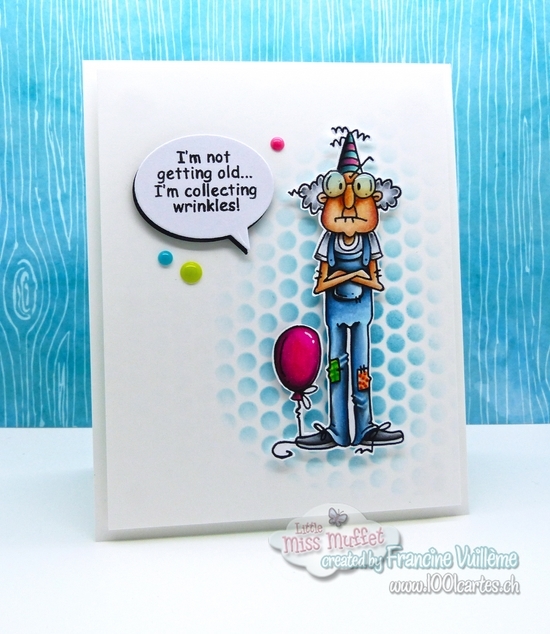 It’s a digi stamp from the *NEW BIRTHDAY RELEASE* called Grandpa's Wrinkles. I colored the image with Copic markers and did the background using a stencil and Distress inks.I added Glossy Accents to the glasses and Wink of Stella clear pen on top of the balloon. ah ah ah, excellent! j'adore la tête de ce grand-père et surtout le texte! et comment ne pas être admirative devant ton coloriage! c'est toujours du grand art! LOL! Oh, Francine, I absolutely LOVE this little ole guy! And the sentiment is so funny! Beautifully colored (as always), and I love the stenciled background!! Stunning (and funny) card, sweet friend! Hugs! P.S. Ich liebe deine Karten! Francine, this is just a brilliant use of color! Love this funny card! AMAZING job with your coloring and with the cool details you added to make this a stellar card!! !